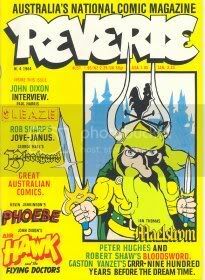 The other day I was cleaning out stuff at my mother's house and found a copy of the first issue of Reverie. Kevin Patrick has written an excellent piece on this early Australian anthology comic - Reverie Remembered - originally written for Collectormania magazine. Thanks for the memories, Kev! I was happy to be a part of this widely distributed (but all too often overlooked) Australian comic of the early '80s. Gary Dellar did amazing things getting a disparate body of work neatly gathered in an ongoing anthology. His commitment was amazing, even to setting up his own press to print the later issues. This cover (featuring Maelstrom) is the one I did for no. 4. Kevin Patrick writes it up better than I could, so I highly recommend his review!